An excellent Double Bass, Piano and Guitar player, Rob Sparx has been writing and DJing dance music since the late 90s. Robs first release in Jan 2004 "Rob the Builder - Can you fix it", was the start of a wave of drum n bass releases on Twisted Individual's label's Grid, Zombie and Up Yours. Rob has also released DNB on Formation records, Propaganda, Vibez (Subject13) and label/distributor Z-Audio. 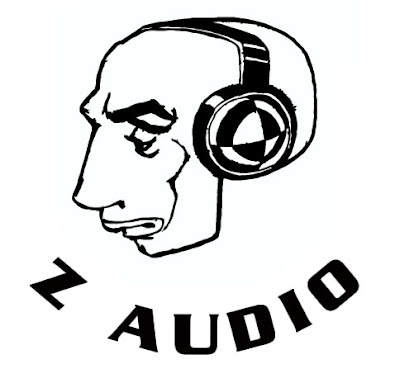 Never one to be pigeonholed Rob soon experimented with other genres producing breaks, house/electro and dubstep most of which was released by labels associated with Z-Audio. Although dubstep is now his main style Rob also writes trance for Armin Van Buren's Armada imprint and has just started 2 of his own dubstep labels "Sour Grapes" and "Migration" distributed by Z-Audio. A 3rd Label “Sub Horizon” will also be launched early next year. Owing to the diverse range of music he produces Robs tunes have been played by a wide selection of DJ's including: Zane Lowe, Kissy Sellout, Eddy Temple Morris, Nerm, Pathaan, Joe Ransom, Skream, N-Type, Distance, Benga, Darkside, TRG, N-Type, Scientist, Walsh, Rusko, Tes La Rok, Sukh Knight, Grooverider, Bryan G, Bailey, Dieselboy, LDouble, Marky, Nicky Blackmarket, Flyte, Ash Attack, James Zabelia, Nick Warren, Anthony Pappa, Laurent Garnier, Colin Dale, Gabriel Ananda, Quivver and 10Sui! Robs tunes have featured on stations including Radio 1, 1XTRA (In mixes on Mary Anne Hobbs show plus a set & interview on Nerms Electro East show), KissFM, RinseFM and Ministry Radio. Artists Rob has worked with include Distance, Cyrus (Random Trio), Reso, Propatingz, TRG, El-B, Tunnidge (Deep Medi), Numbernin6, Synkro, Radikal Guru, Bar9, Nero, D-Ranged, Subject13, Phantasy & Shodan, Twisted Individual, Zen, Sharooz, Tom Pooks, Pablo Bolivar and Mike Foyle (Armada). 2009 saw the release of Rob’s 2cd album Trooper with vinyl samplers which includes remixes from Distance, TRG, Reso, Bar9, Synkro & Indigo and received many great reviews from magazines such as Knowledge (“an unpretentious masterpiece”), IDJ (“impressive throughout”), ATM (“Very well produced dubstep”) and inet sites like Getdarker (“A well crafted mix of tracks”). Since finishing the album last year Rob hit the DJing playing alongside the likes of Skream, Benga, Caspa & Joker plus touring Europe with gigs in Poland, Belgium and Holland with a 3 week US/Canada tour currently being planned for 2010. DFRNT is a 26 year old Scottish producer and DJ working out of Edinburgh. Currently, DFRNT produces music, runs the Echodub label and collective, is editor for Modus magazine, and writes the SittingOvation blog. 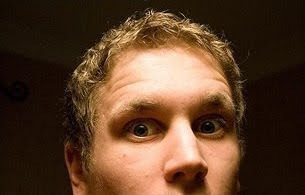 With debut album "Metafiction" released in late 2009 on On The Edge records, DFRNT has seen support from many of the worlds top dubstep producers and DJs, from heavier hitters like N-Type, Baobinga and Headhunter, to deeper selectors such as Synkro, Scuba or dub-techno don Quantec. 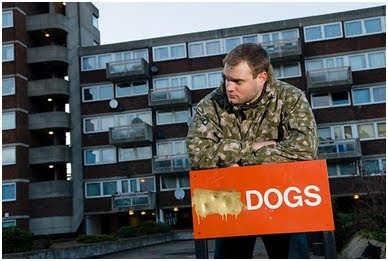 In November 2009, he was asked to put together a mix for Mary Anne Hobbs’ legendary BBC Radio 1 show, and since that airplay, he has scheduled releases on a number of labels including On The Edge, Futurism Recordings, the tentracks initiative and his own imprint Echodub. With his album Metafiction, DFRNT really pushed the deeper side of the dubstep and electronic sound, and backing this up with remixes from big players such as Scuba, Ital Tek, Quantec, Synkro, Indigo and DJ Madd - he took his sound towards the dancefloor. 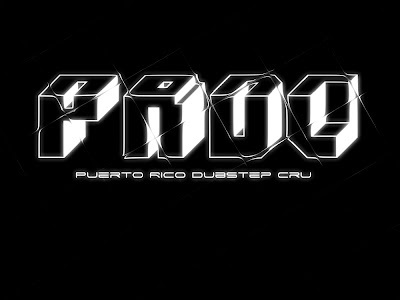 PRDC is a Collective of different minds in contribution to the uprising Dubstep sound in the island of Puerto Rico. 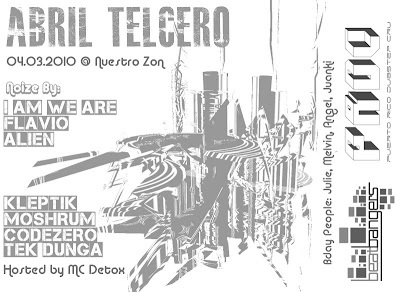 Forged by MOSHRUM, CODEZERO and Pipo.Exe. This Cru has proven its quality and energy in every single event, as their roots vary from Reggae, Nu Skool Breaks and Drum and Bass. 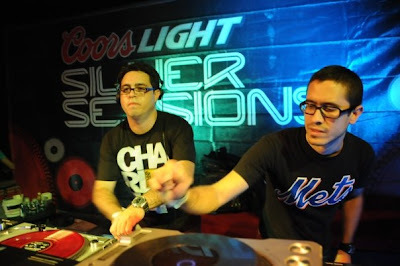 MOSHRUM started in 2001, touring around the island with his bass focused, tear out Breaks. 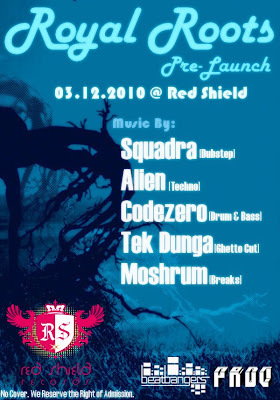 Codezero started in 99 as one of the key dj’s and producers of the Drum and Bass scene in PR. 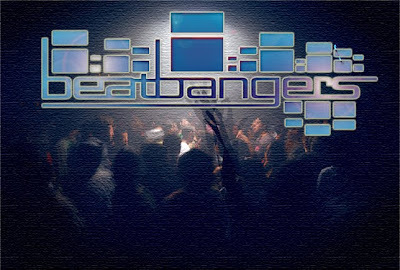 Acclaimed and respected by the electronic music community for dropping fierce, heavy and bass filled tunes from this new eclectic music movement. 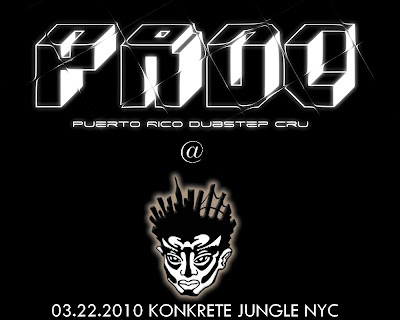 role in the PR dubstep scene.